In addition to the musical talents of its residents, the village is known for the intricately embroidered blouses the women make and wear. The design of both the cut of the blouse and the patterns of embroidery are uniquely Santa María Tlahuitoltepec. If you see someone wearing one on the streets of Oaxaca, you know immediately where it came from. I have a blouse and Chris bought a couple to decorate the walls of his house. I urge you to forgo these and other high-priced knock-offs. Instead, go to the source and buy originals from the talented artisans who created them. And, a note to ReMezcla, especially given the subject of your article, I would have appreciated credit for your use of my photograph (above) from the Guelaguetza desfile, that I originally posted July 22, 2013. Update: A press conference by municipal authorities and embroiderers from Santa María Tlahuitoltepec was held on June 3 at at the Textile Museum of Oaxaca protesting the lack of respect by Isabel Marant for the creativity and work by the women of Tlahuitoltepec and the history and worldview that gave birth to their designs. Thanks so much for shining a light on this situation. Shame on Neimans. Thank you for appreciating the issues and please spread the word! Are you writing Neiman to complain? Connie, probably not. Contact information for that kind of complaint is not evident on their website and I don’t have the time to research it further, nor do I have the confidence they would even care, as I’m not a member of their target market. I can’t believe they are not aware of the uproar and wouldn’t be surprised to learn Susana Harp did contact them. Everyone ‘rips off’ everyone else in the name of fashion. It’s nothing new – but I think that Susana Harp mis-represented the problem – which was that the Mixe made the garments – and that they were upset that no credit was given the makers and the culture. Not to be a devil’s advocate – but I think there is probably a LOT more to the story. Perhaps one of the coops that made them wasn’t paid enough for their work – or perhaps another group didn’t get the contract and so there are hard feelings and politics involved. Not unusual among artisan groups. Remember that this Mixe blouse/shirt is a garment inspired by contemporary fashion – but their machine embroidery patterns are definitely unique to them. Many other Mixe’s wear simple white huipiles with a little red trim around the neck. So actually where did this blouse come from in the first place? This story has been changed and sensationalized etc etc. Let’s go ask the Mixes what the real story is…. and if you want the real-deal come to Oaxaca and buy one…!!!! Sheri, I’m not so sure the garments were Mixe made. According to this article , they were made in India. In addition, I couldn’t find anything that indicates the designer runs a “fair-trade” company and, in fact, Rank-a-Brand gives it a zero rating. Yes, everyone rips off everyone in the fashion industry, but that’s not an excuse for appropriating the designs of indigenous communities without even acknowledging the inspiration for the designs, let alone not paying them a dime/peso. They count on marginalized communities not having a voice, so the deception and misrepresentation of talent by these “designers” remains concealed. Sheri, I’ve added an update re a press conference by officials from the Tlahui community that explains what this kind of cultural appropriation means, the disrespect it demonstrates, and calling on the Mexican government to defend the cultural identity and heritage of its indigenous populations. Great stuff Casita… and it’s a double theft… of culture, theirs… and art, yours. the right thing and be responsible for others less fortunate than us. You can find email links to the companies by clicking on the links in the original article posted by Spixl. Thanks, Steve! I’ve added an update re a press conference by officials from the Tlahui community. This issue is pervasive and I hope that enough public outrage is stirred so that a major newspaper such as the New York Times covers it. This might serve to put other designers on alert around the world who do the same on every continent. Thanks for such a fine, respectful article. I hope to go there sooon. Thank you Patrice. I’ve added an update re a press conference by officials from the Tlahui community that explains what this kind of cultural appropriation means and the disrespect it demonstrates. ReMexcla strikes me as a sketchy guy. He defended the rip off by, in effect, defending the capitalist transgressors. To this purpose he diappointedly played fast and loose with facts rather than intuitively feeling support for the villagers. I’ve emailed ReMezcla, but haven’t yet received a reply. However, the central issue remains the disrespect and cultural appropriation by the designer. Thanks for reblogging! I’ve added an update to the post with articles reporting on the press conference at the Textile Museum of Oaxaca by members of the Tlahui community. Susana Harp actually says the blouses are “identical” – who is to say that their buyer didn’t just buy them at the markets in some other part of Oaxaca? In that case the village would have profited from it. I travel to central Oaxaca and buy many different gorgeous hand made blouses and we credit which villages they are from. If Neiman Marcus doesn’t mention it it’s a missed marketing opportunity not a crime. Neiman Marcus does not have a factory – they have buyers. Or is this about the money and how the fashion industry has a mark up? Don’t make me laugh – you should go to Tulum and see them mark up to 400- 500% – because their market of New Yorkers can handle it. Definitely more to this story…. According to one of the articles, the copied blouses were made in India. I’ve added an update re a press conference by officials from the Tlahui community that explains what this kind of cultural appropriation means, the disrespect it demonstrates, and calling on the Mexican government to defend the cultural identity and heritage of its indigenous populations. Lots of interesting “can of worms” comments here. Makes me want to go put on my blouse. They are made by the women of Tlahuitoltepec; I’ve talked with several of them, both at various expo-ventas in the city of Oaxaca and up in the village. Take a look at the links to the press conference that I just posted. If you don’t read Spanish, run the text through a translator for an understanding of the designs, meaning, and origins. 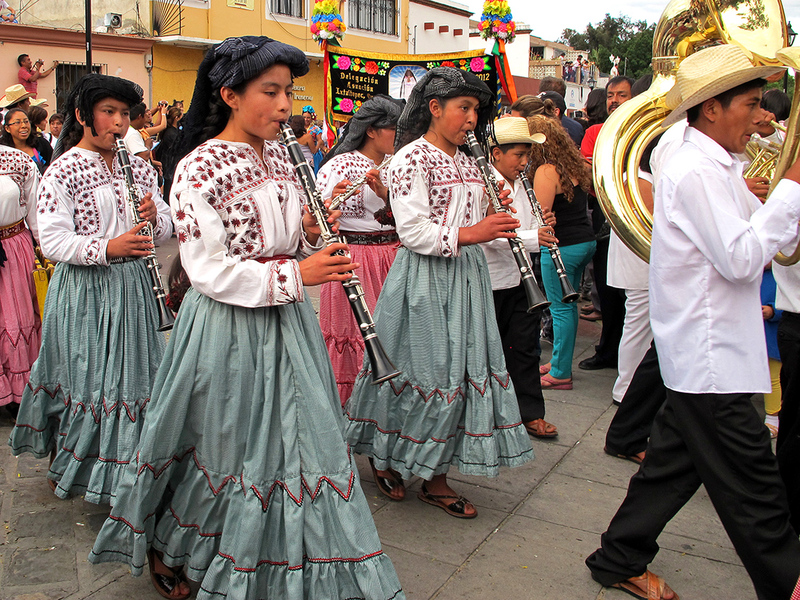 Let’s not think this is only happening in this village of Oaxaca. 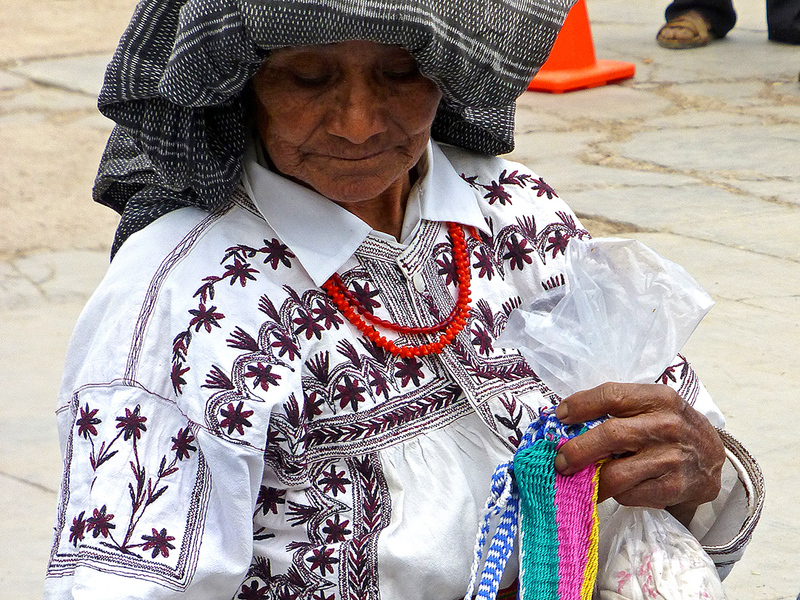 Everyday copies of the crafts and art forms indigenous to Oaxaca flood not only that city, but the rest of the world. Cheap copies, great copies, theft of ideas, etc. It’s all about not respecting the original artist/maker and being, in many cases, unwilling to compensate them for their time and creativity at fait market value. The way I see this, no harm has been done to anyone. Tempest in a teapot. 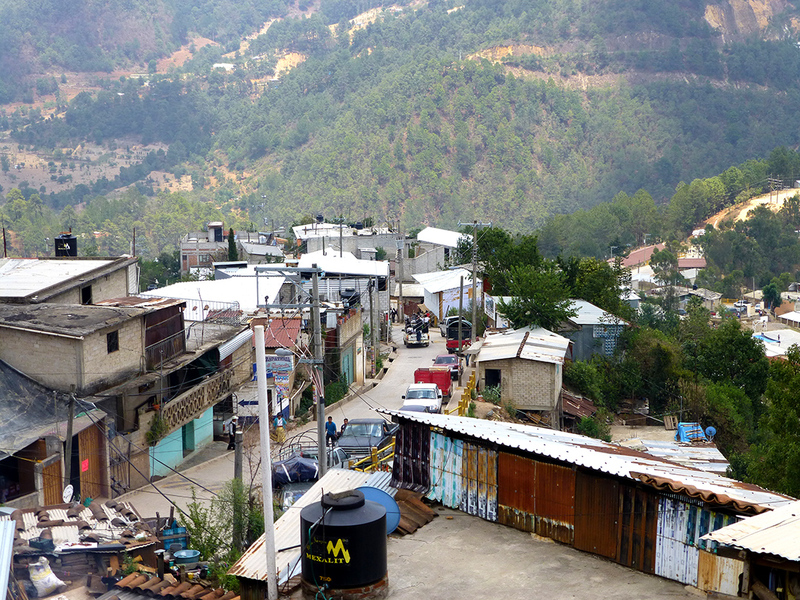 Before Susana Harp let them know, the people of Tlahui were unaware. She has since been fanning the flames, convincing the authorities in Tlahui that they should do something about it. All the while keeping her name in the headlines. The most recent evento was the “‘press conference” held at the Oaxaca Textile Museum operated by Susana’s Uncle Alfredo’s Fundación Alfredo Harp Helú. The people of Tlahui are intentionally being embroiled in a controversy not of their own making and which will avail them little. I don’t know what to say. Throughout the centuries artists, etc. have been borrowing from other cultures. Artists and graphic designers do it all the time. Even “sacred” mole can be traced to the influence of the spices used in the curries of India and the middle east. Everyone borrows from everyone–this a common truth. In the sciences, research builds upon previous research. 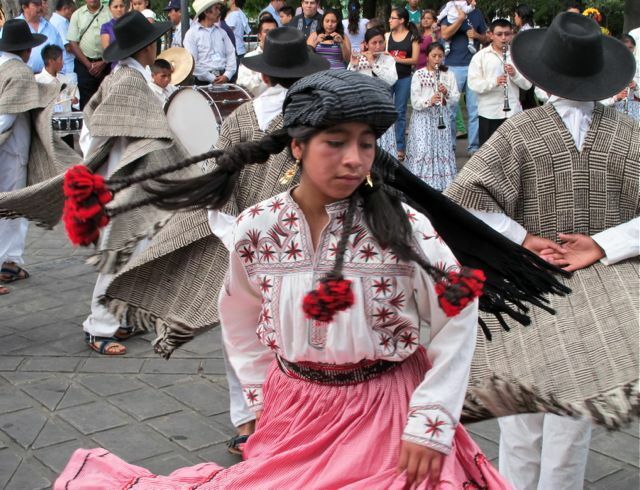 Take a look at Mexican folk dance and you will find, that and I can’t recall her name, a choreographer from Mexico City is responsible for the “pineapple dance” and many others considered authentic in Mexico. Just a comment. I think the choreographer Juan is referring to is Paulina Solís Ocampo. She created the dance in the 1950’s. …and these skirts look suspiciously like, well you know.